I was once at a funeral reception making small talk with the various guests. I found myself chatting with the Vice President of a prestigious firm. It was the first time we had ever met. While I was not seeking any specific end, he was particularly impressed with my confidence and saw potential in me right away. Within a few weeks I was sitting in his corner office reviewing a job offer. The point here is that being charming, confident, and courteous are qualities that should not just be reserved for the odd interview. At any time you can be talking to a prospective employer. 1. Don’t be bitchy to a receptionist. Reception is your opportunity to make a good first impression. Realize that ignoring or being dismissive with a receptionist is rude too. Feel free to ask: How are you? How long have you worked here? How do you like working here? Of course, don’t bother a person who’s busy but demonstrate that you are personable and would fit in well. 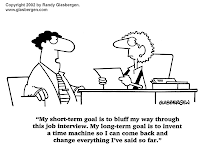 Your interviewer may ask reception for an opinion or feedback. Use this opportunity to score points not lose them. 2. Practice your communications skills daily. 3. Avoid coming on strong. Never give too strong of an opinion until you first discover where your audience stands. People like individuals to which they feel they can relate–having an outlook or opinion in common can be the key to building a good relationship. If you work on understanding people’s cues and responding to them, you have a greater chance at being a natural success in an interview. -you don’t care about the job for which you are applying. -you’re disinterested in a conversation. -you’re preoccupied with something else in your life. The solution to this is to be genuine. Focus on what you’re doing and convince yourself you mean what you’re saying. If you cannot master this, your communication will never be truly effective. For interview workshops and coaching, contact me at juliana@jtcina.com.